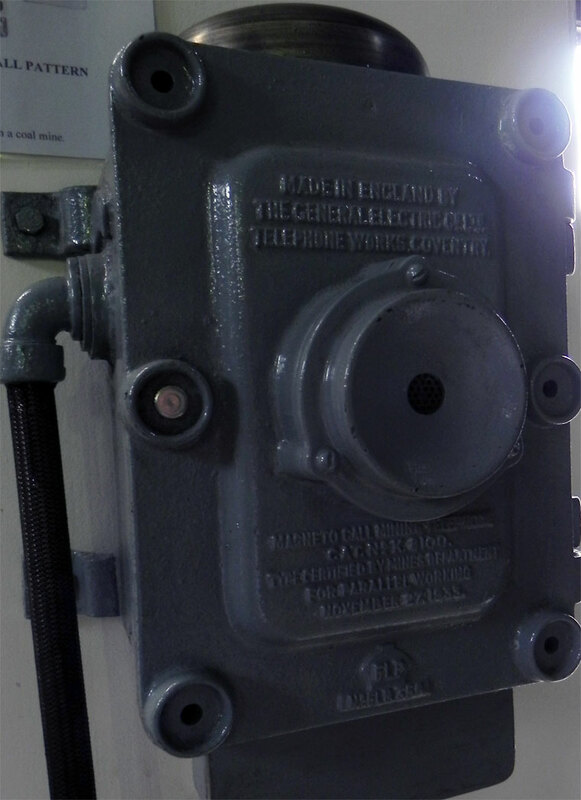 Telephone - wall mounted unit for use in mines. Note: This is a sub-section of GEC. 1910 On 24th December GEC incorporated the Peel-Connor factory as a separate company, employing 1000 workers, entirely devoted to telephone and telegraphic apparatus. The Works produced everything from parts to full telephone exchanges. The first exchanges installed were at Glasgow and Willesden. 1911 First export sale to Australia of 6 exchanges in the Adelaide area. 1912 The GEC catalogue noted that the company held the sole sales rights for the products of the Peel-Conner Telephone Works Ltd. In addition, GEC sold telephones from L M Ericsson (telephones and parts), Alfred Graham and Co (ships phones), Fox-Pearson(fire alarms), Sinclair (insulators) and many others. Peel-Conner also made Western Electric-pattern telephones and parts for the British Post Office under the BPO's contract-sharing arrangements, designed to support local manufacturers. 1914 Manufacturers and installers of telephone apparatus of every description. 1,000 employees. 1915 Mr. Conner visited Coventry seeking opportunities for expansion; he saw that the population growth due to the expansion of the motor industry would provide a good supply of female labour. On his recommendation, GEC bought the Copsewood estate at Stoke, Coventry. After WW1, developments in the telephone industry were met by GEC by investment at the new Coventry Works. Also the BPO standardized on a limited number of designs of telephone. 1921 GEC liquidated the Peel-Conner company and moved all its manufacturing to the larger Coventry factory. GEC continued to use the name Peel-Conner Telephone Works for the Coventry factory but its products were gradually rebranded GEC. 1922 The Post Office selected as its standard for automatic telephone exchanges the Strowger system (using step-by-step working using two motion selectors). 1922 Transmission Division formed to design and manufacture equipment for long-distance telephony. 1923 Mr. Conner returned to America. The Conner Magneto Ignition company went into liquidation. Its factory was turned over to the production of crystal sets and absorbed into the main telephone works which was renamed GEC Telephone and Radio Works. 1923 Production of radio sets, including Gecophone Crystal Sets, began at Copsewood. 1924 First GEC Strowger automatic telephone exchange installed in Dundee. 1928 Land on the western boundary of the Coventry factory was acquired, providing two more entrances. 1929 Designed first unattended rural automatic exchange standardised by GPO. 1930 Development of telephones and automatic exchanges, as well as totalisators and broadcasting sets. 1932 First GEC single-channel open-wire transmission system installed. 1936/7 Telephone and radio production expanded beyond capacity of Copsewood site. Additional premises acquired in Whitefriars Street (ex Coventry Swaging Co); Priory Street (ex Triumph Motor Co); Ford Street (ex Lea Francis Motor Co). 1937 Larger rural exchange units were adopted by the Post Office. 1938 Widespread use of automatic telephone exchanges of which GEC had supplied a good proportion. 1939 Factories in Spon Street (ex Rudge Whitworth Motor Cycle Co) and Queen Victoria Road (ex A. C. Wickmans) acquired for expansion of wartime production including two-way radio for fighter planes and airborne radar for nightfighters. 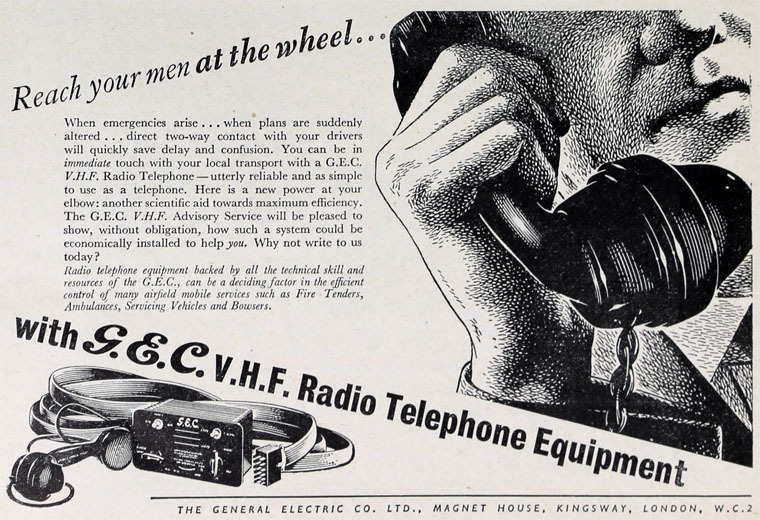 1939 GEC reported that multi-channel telephone circuits had now been adopted as the standard for the future. Short-wave transmitters also developed for communications. 1940 Introduced transmission system carrying 12 speech channels. 1945 Helen Street factory acquired from The Rover Company for expansion to meet postwar demands for telecommunications services. 1958 GEC had 3 main products groups, one of which was Telecommunications, which made telephone exchanges and radio communication equipment. 1963 GEC began development of computers for telephone exchange control. 1964 First completely transistorised microwave-radio system introduced. 1965 First reed-electronic exchange in UK network installed at Leamington Spa. 1966 Began quantity production of reed-electronic exchanges. 1971 First computers in UK network supplied to control 100 exchanges. 1972 Supplied first pushbutton telephones in U.K.
1974 Production of Strowger electro-mechanical telephone exchange ceased in Coventry, replaced by electronic systems. 1977 Awarded development contracts for System X. Introduced computer-controlled digital PABX - Private Business Exchange Systems. 1980 First System X exchange installed in UK network. First high-capacity optical-fibre transmission system in UK installed. 1982 First export order for System X. 1983 System X trunk exchange installed in Coventry. On 1st April 1988 GEC and Plessey Co merged their telecommunications businesses as GEC Plessey Telecommunications, commonly known as GPT. GPT was a world leader in many fields, for example Synchronous Digital Hierarchy (SDH) technology, and this brought the two companies responsible for developing and building the System X telephone exchange together, which was supposed to make selling System X simpler. This page was last edited on 31 March 2016, at 08:11.